Audi and all-wheel drive go together like mothers and apple pie. The German automaker has cultivated its Quattro systems as emblematic of its raison d'etre, incorporating it into its rapidly expanding range... with one exception: the A1. But that's about to change. After launching the diminutive hatchback in front-wheel-drive only, Audi is working on extending the traction to the rear wheels as well. And to give us an idea of what to expect, the company has launched the A1 Clubsport Quattro concept among the 18 vehicles on display at its annual celebration in Wörthersee. The little beast is built around an extensively tuned 2.5-liter turbo five with just under 500 horsepower. Optimized by direct injection and channeled to all four wheels through a six-speed manual, Audi claims the concept can hit 100 km/h (62 mph) from a standstill in a scant 3.7 seconds, doubling that speed in 10.9 en route to an electronically limited, Autobahn-crunching top end of 250 km/h (155 mph). The package is rounded out by an aggressive wide-body aerodynamic kit, decked out in matte white paint with a carbon-fiber roof, with a side-exit exhaust and 19-inch alloys. While the production A1 Quattro and the S1 or RS1 to follow isn't likely to pack the 500 horses of the show car, gamers can check it out in Need for Speed â??â? ?World for a limited time. 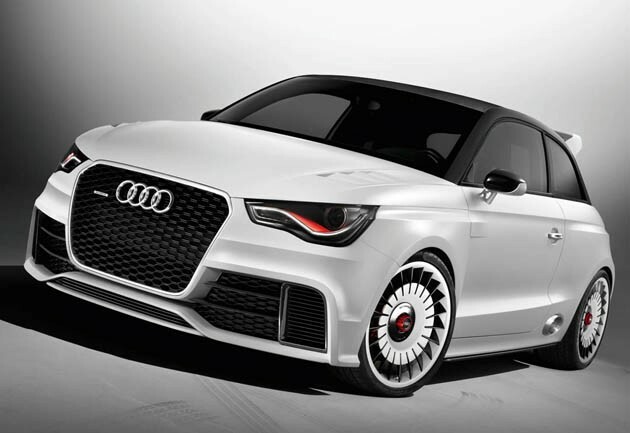 Audi unveils 500hp A1 Clubsport Quattro show car at WÃ¶rthersee originally appeared on Autoblog on Tue, 31 May 2011 08:56:00 EST. Please see our terms for use of feeds. That is so sweet, I would love one! Holy poop! 500hp in that? Thing must fly! Looking to the side paneling and wheel base/wheels, I see a cross between a Mini and Fiat 500 only a little longer. Fiat 500 with a new nose and some tweaks.